It's the first day of the month and you know what that means, right? Yep! 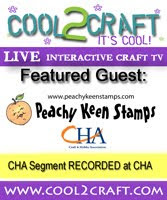 It's time for some peachy sneak peeks! We've got a Spring themed release that promises to bring your crafty mojo right out of those Winter doldrums and give you a renewed enthusiasm for doing what you LOVE! Here's the card I created with the new Stamp of the month Kit! If you're lucky enough to be a member of the club, this great set will be arriving at your door very soon!! My cute little blue bird was stamped with Memento Tuxedo Black Ink onto X-Press It Blending Card and colored with Copic Markers. The paper is from my stash, and the jute ribbon is one of my recent Stampin' Up! purchases. Your card is amazing! Love that birdie! Great job! Your birdie is so darn good! Wonderful graduation card, and love the extra quote on the bottom. This is so cute Lorie! I love the layout of this card and of course your coloring is amazing! Fantastic job! Lorie this is so awesome, as always! I totally love your blue bird and I agree with Mel, love the quote! Lorie ~ Oh I can TOTALLY tell this release is sweeter than honey! Look at this ADORABLE card! The desing alone is FAB but your coloring is simply AMAZING as always! Someday when there is someone lurking over your shoulder please don't be scared it will be me! WOW ~ I so need that little birdie! Beautifully done as always! I so love the cute little birdie!! Your coloring is amazing. how did you acheive the speckled background effect?? Darling card. As always amazing colouring. Oh goodness, is that a TWEET bird! Love the coloring! And I just can't help but smile when I see her! what a cute birdie! love it!